Illusions of harmonious expansion of Estonian internet network got crushed on October 17th as into numerous inboxes of entities responsible for Estonian IT-development and of media outlets landed a press release by Estonian Broadband Development Foundation (ELASA). Outwardly, the message was simple and short: council of the foundation and its only board member Olav Harjo no longer get along and, therefore, they will part ways at end of January. The announcement was probably agreed by the parties, but Mr Harjo was not about to just get up and go. Of course, for years there had been this wonderment over how all related EU funds kept falling to one and the same foundation – ELASA – and why the good internet ever failed to reach the people. Falling to a foundation created by largest local telecoms to spread optical lines across Estonia under aegis of EstWin – their own mobile masts included – to then provide mobile data communication to end users. For fee, of course. «This is no way to develop the network. I hope this message of mine at least triggers a discussion, and perhaps this time something will actually be done,» Mr Harjo explained his motive to Postimees, yesterday. The fight actually got so bad that ELASA council led by Elisa representative Andrus Kaarelson reviewed their decision and released Mr Harjo from being CEO to the foundation starting yesterday already. But let us return to the press release – what, then, were the revolutionary messages thrown into the limelight by Mr Harjo? His main idea was simple: by the creation of EstWin’s network, the main aim of the project – creating high-speed internet connection to people living and working in the countryside – will in no way be achieved. Instead, for taxpayer money, a backbone network is being built for Estonia’s richest firms, something they would do even without the taxpayer money considering the market situation. «In ELASA, it is business interests that dominate, not consideration of Estonia’s actual needs,» continued Mr Harjo. In his assessment, the economy and communication ministry responsible for internetisation of Estonia must now act fast to find out why, despite the vast backbone networks being built, homes and enterprises in rural areas are still not offered high speed internet connections. 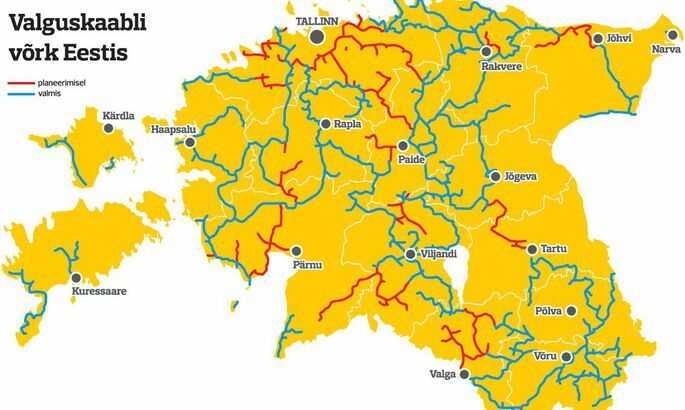 To comment on the criticism, economy/communications ministry’s communication department head Tõnu Nirk said that connection of mobile masts to basic network has not been a goal in itself, but rather a complementary measure to offer fast mobile internet on entire Estonian territory. «With the current means, this is the most expedient way of offering internet connection to end users in rural areas,» said Mr Nirk. Meanwhile, by Harjo interesting numbers were served regarding investments by the telecoms: as ELASA was created, all founders invested therein a total of half million euros; pursuant to existing plans, the completion of the entire EstWin network will cost close to €74m which will largely come from the state. «Explaining: for half million euros, the founders of ELASA will get a network costing €74m i.e. their investment grows 148 times!» said Mr Harjo. Should it happen that for whatsoever reason ELASA is some day liquidated, said he, then the statutes prescribe that all the assets will be divided between founders i.e. the telecommunication companies. Mr Harjo said it is Elisa who needs the EstWin cables to its mobile masts most, as Eesti Telekom and Tele2 do partly have their own network. Mobile operators desired not to comment on the criticism of former head of the foundation yesterday, having agreed that the role would be for chairman Andrus Kaarelson to carry. Yesterday, Mr Kaarelson explicitly said thus: Olav Harjo has indeed worked hard to develop the EstWin network, but has begun to air false accusations after losing trust. He failed to see EstWin’s situation through dark glasses as «thanks to ELASA’s optics hundreds of small towns and villages are supplied with contemporary services». Mr Kaarelson said the ELASA project has moved along as planned. «The internet backbone network currently built is the basis for future last-mile, which option the local governments have also begun to use,» he said. As the actual reason for the quarrel, he cited that Mr Harjo had paid himself higher salary than planned, without council’s knowledge and with no contract, while working in ELASA’s subsidiary. Unless some faster data transmission method is invented next to optic, the network will last for decades if not centuries. Currently, we will only be using a fraction – the network has been created with lots of spare capacity. We will fix our basic networks so in the future it would be ready for the Internet of Things and other updates. Also, our legal space was inadequate and did not allow taking cables to buildings cheaply and without complex coordination of projects. For that very reason we laid the emphasis in the air as this is simply cheaper. Thereby, we have solved our main problem and created a very speedy mobile internet for all of Estonia.